The St. Regis Resort Mauritius (top left to bottom left: clusters of villas, my room and bathroom; top right to bottom right: the beach and main pool). The St. Regis Mauritius is a sprawling luxury resort at the foot of the World Heritage listed Le Morne mountain in the southwestern corner of the island. This colonial-style resort has 172 rooms and suites which are located in double-storey villas scattered along the beach, many with breathtaking views of the lagoon and the ocean. My room was very spacious, with a large bathroom (separate shower and bath-tub), a bar, working table and a cosy terrace outside. Each cluster of villas has its own pool and butler service. The jaw-droppingly beautiful beach is never more than a few steps away, and because the property is so spread out, it always feel tranquil, making it perfect for couples or a honeymoon. In addition, the Iridium Spa offers a huge variety of treatments in a separate building. The St. Regis Mauritius has six restaurants/bars offering cuisine ranging from French-inspired and traditional Mauritian cuisine, to the exotic dishes of India, Southeast Asia and Japan. The calm lagoon is perfect for all sorts of water-sports, from kite-surfing (one of the best kite-surfing spots in the world is around the corner) to stand-up paddling, windsurfing and snorkelling. Check for rates. Maradiva Villas Mauritius (top left to bottom left: my villa with private plunge pool, the main pool; top right to bottom right: living and bathroom in my villa, and the gorgeous sunset from the beach). The Maradiva Villa Resort is located in Flic en Flac on the west coast of the island. This resort is the only five-star resort on the island that offers only villa accommodations. The 65 villas are fabulous, with a spacious patio and a private pool, a large bedroom, walk-in wardrobe and perhaps the biggest bathroom I’ve ever laid my eyes on – the bathroom has a bath-tub, indoor and outdoor showers! Of all the accommodations I stayed at in Mauritius, this villa definitely ranked high. The resort is spread out across a large area, with a Spa, several restaurants (I loved the modern Indian cuisine at Cilantro) and bars. Facing west, the long beach (protected by reefs) is the perfect spot for water-sport activities and to view the amazing sunsets. The Maradiva Villa Resort is great for couples, honeymoons and families. Check for rates. Angsana Balaclava (top left to bottom left: the main resort building and pool and the smaller clusters of villas; top right to bottom right: my room, the pool and a gorgeous sunset from the beach). 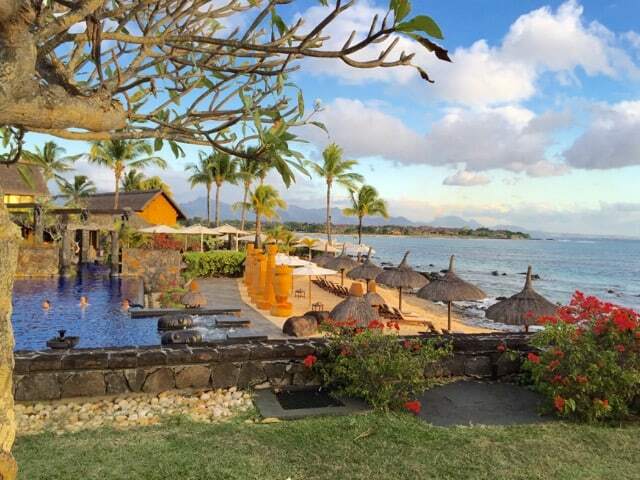 The Angsana Balaclava is set in Turtle Bay on the northwestern coast of Mauritius. This is another stunning resort featuring typical Mauritian architecture, a gorgeous lagoon pool and a fabulous beach. The rooms are located in separate blocks that face the pool. There is also a selection of beautiful suites that overlook the pool, gardens or the beach. The beach is broad and shady and the sunsets from here are breathtaking. For a bit of indulgence, there’s the lovely Angsana Spa, and for those seeking a bit more action, the resort offers a variety of water-sports, adventure bike tours and cooking classes. The resort also has its own marine Conservation Centre and guests are invited to participate in coral-planting and snorkelling safaris. The Angsana Balaclava is perfect for couples and families. Check for rates. The One & Only Le Saint Géran (top left to bottom left: view of the beach from my room, sushi lunch at the poolside; top right to bottom right: my room, the pool at the spa, and the overwater Indian Pavilion restaurant). The One & Only Le Saint Géran is the grand dame of luxury resorts in Mauritius. Situated on a long expanse of beautiful white sand fringing a cove and surrounded by lush gardens, the One & Only Saint Géran oozes a sense of establishment and tranquility. The gardens, with their palms and flowering shrubs are absolutely gorgeous. The 166 spacious rooms, with private terraces, face either the beach or the cove. There were two highlights of my stay here: the Spa (the masseuse was top-notch!) and the terrific personnel who truly excelled in providing attentive service without being obtrusive. In addition to water-sports activities, there’s a beautiful golf course next door and the resort also organises a variety of great activities such as wine-tastings. Oh, and there’s a Kids-Only club as well, making the resort one of the best in Mauritius for families! The resort serves excellent cuisine at the PRIME grill and my favourite, the Indian Pavilion, that’s built on stilts above the cove. Check for rates. 20 Degres Sud (top left to bottom left: the pool, the stunning Ile Plat (Flat Island); top right to bottom right: room/bathroom, the guest lounge/library. 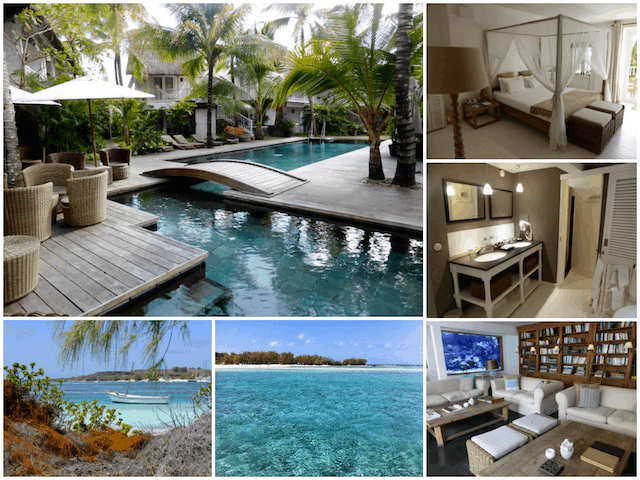 The 20 Degres Sud Boutique Hotel is a truly special place located in Grand Baie on the north coast of Mauritius. The entrance to the hotel is rather unassuming but inside, you’ll be greeted by friendly staff and an interior that oozes luxury and charm. The cosy interior, designed by a renowned Belgian interior decorator, will make you feel right at home in an instant. The hotel has 30 rooms and suites, each with a terrace overlooking the coconut grove and/or the ocean. 20 Degres Sud has three amazing dining options – at the hotel’s lovely restaurant, on the Lady Liesbeth vintage boat or in the Governor’s House, an old ruin on Île Plat (Flat Island). The hotel is perfect for a honeymoon or couples looking for a tranquil getaway. Snorkeling in glassy water off Ile Plat (Flat island). My highlight was spending the day on Île Plat. The journey itself on a sail boat was unforgettable – at a certain point, we were accompanied by whales and dolphins! – and the island, with its incredible beaches and crystalline water (in colours ranging from intense cobalt blue to aquamarine, turquoise and emerald green), was a sight to behold. Gosh, I dream of returning to this hotel one day! Check for rates. 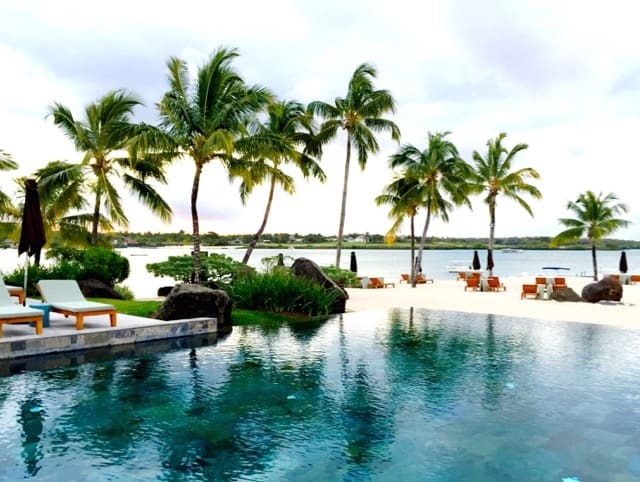 Widely recognised as one of the most luxurious resorts in Mauritius, the Four Seasons Mauritius comprises 136 villas spread out across extensive grounds on the mainland as well as an island in the lagoon. The infinity pool at the edge of the beach. In my post about my stay at the Four Seasons, I remarked: “I gasped as I stepped into the three-bedroom Garden Residence villa I’d been booked into. It was HUGE, something that was not apparent from the outside. A large living and dining area opened out into an equally large patio with a plunge pool that seemed to spill out onto the massive lawn. There were three spacious bedrooms, each with a big en-suite bathroom (with a bath-tub and indoor and outdoor showers!) and walk-in closet, making it perfect for a group of friends or families. The villa measures a whopping 288 square meters with a further 1,150 square meters of outdoor space! My first thought: “OMG! I don’t want to ever leave this place!! !”.” I’m pretty sure you won’t want to either! Check for rates. Situated about 15kms from Port Louis, the capital of Mauritius, The Oberoi is a gorgeous resort set amidst lush sub-tropical gardens at the edge of Turtle Bay, which is home to a vibrant coral reef. The rooms and villas are spread out across the estate, all within walking distance of the glorious beach. There are several restaurants as well as a spa. My highlight was my villa, with a garden and private pool, and fabulous views of the beach and sunsets! Although it fronts the beach and one of the resort pools, the villa had a secluded feel due to the low wall surrounding the garden, making it perfect for couples and honeymooners. Check for rates. 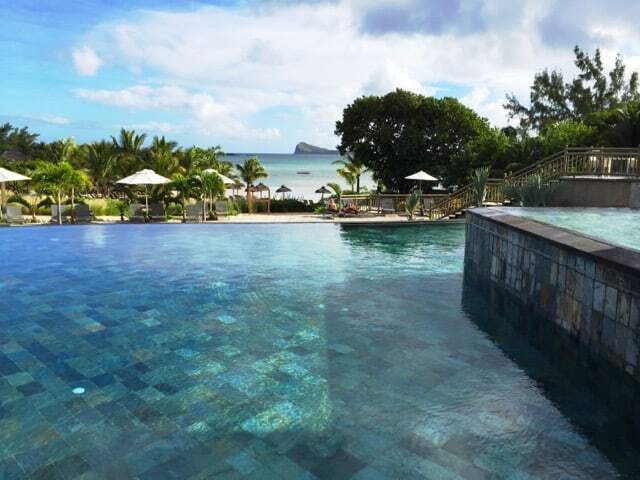 Fringed by a broad arc of fine, white sand and a crystal-clear lagoon, the Shanti Maurice resort consists of a series of low-rise villas surrounded by beautifully-kept gardens. My spacious room had a large balcony which overlooked the infinity pool and the pristine beach. There are various dining options but my favourite was definitely the Rum Shed. Tucked away in a corner of the sprawling resort and modelled after a traditional Mauritian beach bar/restaurant, the Rum Shed is a cool place with a sandy floor, tasty cocktails and terrific local food. And while you’re at the resort, book a treatment at the Nira Spa, arguably one of the best spa treatments I’ve had in Mauritius! Check for rates. The Le Telfair Resort is part of the Heritage Resorts estate, a huge swathe of land (2,500 hectares to be precise!) from the seemingly-endless beach right up to the verdant hills of the Frédérica Nature Reserve on Mauritius’ south coast. There are various accommodation types, from luxurious rooms to stunning private villas. The resort also has a golf course, its own nature reserve, an extensive spa and a multitude of water sports activities. Check for rates. The Zilwa Attitude resort is situated on the island’s north coast and is composed of a maze of pools surrounded by low-rise buildings with incredible views of the azure lagoon, and fringed by a blindingly white beach. It also has its own private island and beach in the lagoon! Check for rates. Note: This post is the result of the #MyMauritius blog trip which was created and managed by iambassador and AHRIM in association with the Mauritius Tourism Promotion Authority and Air Mauritius. Velvet Escape maintains full editorial control of the content published on this site. Indeed a tough choice to make! There are so many stunning hotels in Mauritius to choose from. Good luck! Haha! All five hotels look so fab – how do you choose? We’ve stayed at the One & Only Palmilla in Los Cabos (so we have not doubt the One & Only Le Saint Géran would be equally gorgeous). Then again, we love boutique hotels and the 20 Degres Sud Boutique Hotel looks more intimate and boutiquey. We’d love to visit Mauritius and be faced with this decision :-). Thank you for this information, it’s therapy looking at those pictures now here we are in Norway! Any one of these resorts would be an amazing place to take a vacation on Mauritius … such a paradise that not many know about back here in North America! All those hotels looks like paradise. I cannot wait to relax in a place like that where summer is always there. I love summer. I love the colors and the sunshine and your pictures depict that in an accurate way. There are indeed so many other fabulous hotels in Mauritius. Have to return and check out the rest, especially those on the east coast!